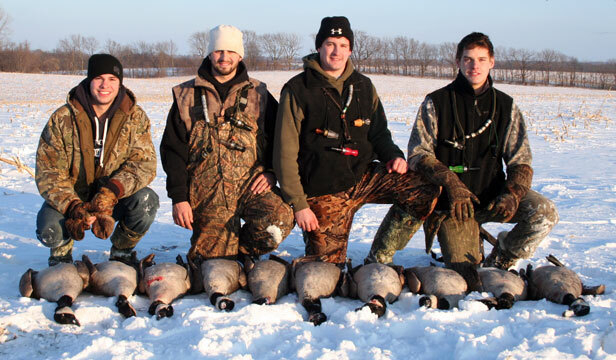 Goose hunting within Mid-America Hunting Association unlike that of our duck hunts, does cover our three state region of Kansas, Iowa and Missouri. The differences lie in seasons, limits and if watching the migration reports, detect if there is an eastern or western concentration in numbers. Otherwise, the advantages the Association brings the goose hunter are the same. The prime goose hunt is for Canada’s. Most of the Canada goose hunting is during the late season as the same hunter is more likely to concentrate on ducks over our managed wetlands from early, late October, through the end of the regular season the first week in January. That same hunter shifts equipment over to Canada Goose hunting typically starting over Christmas holidays until the end of the season. Spring season snow goose hunting is popular for all especially those that took a rest break after the end of the regular waterfowl season. A very late season goose hunting trip by a group of well experienced life long self guided goose hunters. 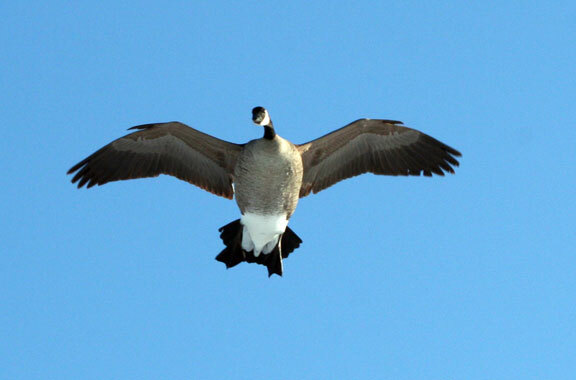 Read waterfowl reports, drive about and see the flights, setup nearby and call. The first day is the hunt that is the hunt is actually scouting out the geese. The second day is a goose shoot. In any case of what subspecies of goose being hunted it is a matter of watching the migration reports and then hitting the road to scout the locality the geese are working. That locality would be further defined as those areas that the Association has private land, crop stubble, near rivers or waterfowl refuges. Once in that area pick a nearby likely field to set up a spread, telephone in a reservation to retain that field for that hunter’s use, place out the hunter’s own coffin blind and start calling. Repeat either by moving that setup or as some do set up a second spread on a different field. Leave the spreads in place for the duration of the hunt or move about as necessary. 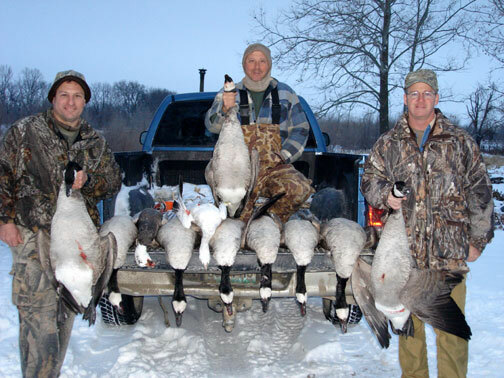 Being an unguided goose hunting organization allows that hunter to make his hunt as he sees fit rather than as through a guide that leads all by the hand. For those wanting a do it yourself hunt it is no longer an issue of finding a single place to hunt it is now selecting from thousands of available acres of where to hunt. A significant improvement from having one or a few places to having a selection of large areas that each has thousands of acres of crop stubble on a variety of wetlands. This provides flexibility at moving to where the geese are rather than depending (hoping) the geese will flyby that day. 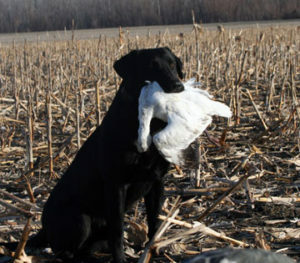 All goose hunts are by hunters supplying their own decoys, dogs, equipment and skill. 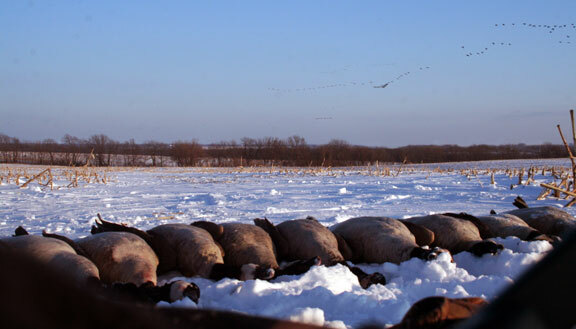 A true self guided goose hunt opportunity. We will get that hunter to the point of where to park his truck, step out and hunt. From that point on the hunter takes care of the rest. Duck and goose bands as a bonus to the hunt. The Association supplies the land and the hunter hunts on his own through a reservation system that prevents competition. No hunter is ever denied the chance to hunt as often as he wants, on his schedule and for the entire season compliant with all state and federal regulations. This is as true for our goose hunts as for duck, deer, turkey and upland. 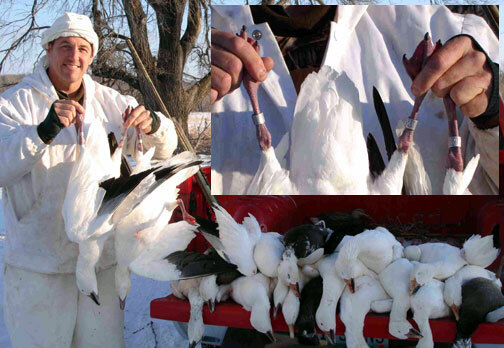 Some results from a cold winter season that we froze out early making for more goose action than for ducks. A rare season and one that showed us how spoiled we had become with our duck hunts.